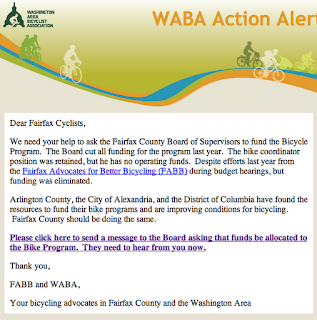 Thanks to all the cyclists who responded to our request, through a WABA Alert, to ask the Fairfax Co Board of Supervisors to fund the Bicycle Program. Operating funds were cut in 2010 and eliminated in 2011. Each Supervisor received over 300 messages from cyclists; they heard us loud and clear, so we don't need to send additional messages. In the FY 2010 advertised budget the Bicycle Program was cut by 45%. See page 121 of the budget document: "This reduction decreases the Bicycle Program operating budget by 45 percent or $170,456." In the FY 2011 budget all program funding was eliminated but as you know, the Bicycle Coordinator position was retained. The funding level before the cuts was around $379,000. We asked cyclists to contact you about funding the program. We were encouraged by their response; there really are many cyclists who want to be able to safely bike in the county for transportation and recreation. Please consider funding the program this year. The Board will mark up the budget on April 24. Prior to that session we will be discussing our request with a representative of the Board. Thanks to the messages from cyclists, the Board knows that the request is not just coming from a small group of activists. Thanks to WABA for helping us with the Alert. If you don't currently receive WABA Alerts, you can sign up online. Good evening. I am here today to ask that you fund the Bicycle Program. Program funding was cut in half two years ago and eliminated last year, at a time when more and more people are choosing to use bikes for transportation. 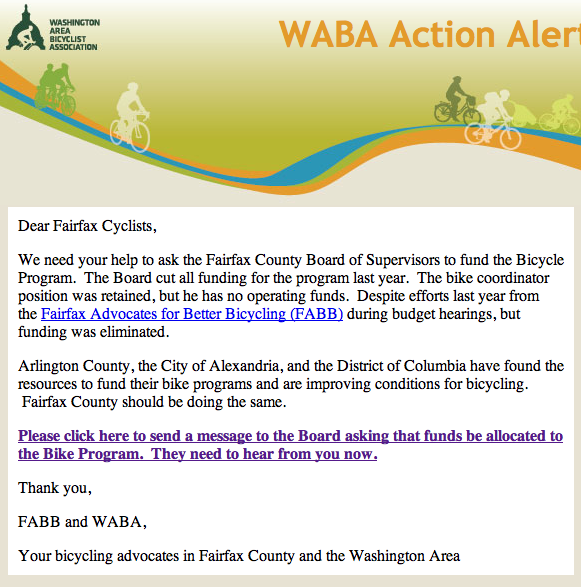 We appreciate your previous support for bicycling in Fairfax. Thanks to your support a great deal of work is being done to create the County Bicycle Master Plan and the Tysons Plan is now complete. Now we need your support to ensure that both plans become part of the Comprehensive Plan. We especially need your support to ensure that both plans get implemented. Most of the recommendations are not costly but they will take dedicated staff time and resources to become a reality. FABB attends many events and we talk to a lot of people. Invariably when we ask people if they ride and we get answers from two types of people: The 1% of fearless riders who will ride anywhere, and everyone else who say they would like to ride more but don't because they don't feel it's safe. The second group represents a wide cross section of people and it's always the same answer. I recently spoke to a woman from San Diego. I asked if she biked. She said she missed being in San Diego where they could bike to shops and to school. When they moved here her daughter asked her why they had to drive everywhere; why couldn't they walk and bike. If we want to provide our residents with a good quality of life, and be able to attract others looking for the same, we need to devote the resources necessary to make Fairfax a better place to bike. Fairfax also needs to attract young professionals to stay competitive with surrounding jurisdictions. In Arlington Co, voters approved a bond that provides dedicated funds for bicycle and pedestrian projects. BikeArlington has dedicated staff to educate cyclists and promote the use of bicycling in the county. They've also committed to implementing the very popular Capital Bike Share system. What would funding for the bicycle program mean? Money for shared lane markings (sharrows) placed on busy sections of road to remind motorists that bikes belong on those roads. Repaving of the Fairfax County Parkway trail, and installation of signs to guide users where the trail diverts from the Parkway. It would mean resources to ensure that the Tysons Bike Plan is approved by the Planning Commission and the Board. Building of small neighborhood connections so that cyclists can avoid riding on busy arterials that have no bike facilities. Support for Bike to Work Day and many other events to encourage people to travel by bike. Implementation of a bicycle counting program to show the increase in bicycling around the county. And much more. Once again thank you for your past support for bicycling but we really do need some dedicated funds to make Fairfax a better place to bike and to live. Awesome! I hope "hearing the message" translates into more funding to support all types of cycling in Fairfax County.